Our local cafe, Olive & Co, does a mean coffee cardamom chocolate cake. It’s more of a torte really as it contains no flour. I’ve been wanting to try making something similar for ages and with the arrival of the new Divine chocolate baking bars, the time seemed right to give it a go. I give you my coffee cardamom chocolate mousse cake. I had a look on line for inspiration and came across an American version of Ottolenghi’s chocolate truffle cake with cardamom and espresso. I adapted it slightly to make it metric friendly. I also swapped some of the dark chocolate for milk and changed the method, which seemed overly faffy. The result was more of a mousse cake than the dense fudgy version at Olive & Co, but it was still utterly delicious and most definitely decadent. 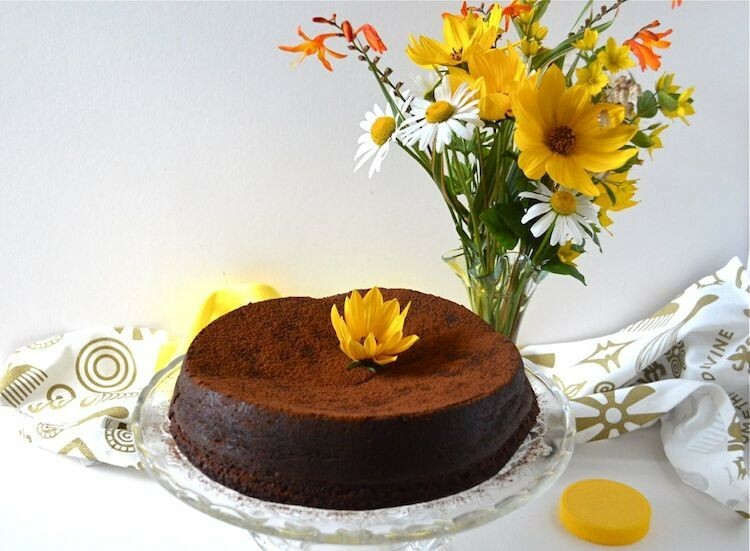 This coffee cardamom chocolate mousse cake contains a phenomenal amount of chocolate, eggs and butter, so it’s best saved for a special occasion. Fantastic as a dessert served with cream or crème fraîche, it also make a delicious afternoon tea treat. Eat this and I guarantee that you’ll need to sit down afterwards. It’s great for those with allergies as it’s naturally gluten free and contains no nuts. Chocolate cake is a wonderful thing, but the Middle Eastern combination of coffee and cardamom give this a more sophisticated and exotic quality – fusion food from the crossroads between east and west. Divine have just launched 200g chocolate bars to add to their ever growing ethical and Fairtrade collection. They are designed specifically for baking, a 70% dark chocolate and a 38% milk chocolate. I was sent some to try, so I decided to make my coffee cardamom chocolate mousse cake with both. A surprisingly light mousey chocolate bake made sophisticated with the Middle Eastern flavours of coffee and cardamom. Naturally gluten free. Melt the butter in a medium sized pan over a low heat. Dissolve the coffee in the water and add to the butter. Break up the chocolate add to the pan and turn off the heat. Allow to melt then stir until smooth. Add the cardamom oil or ground cardamom and stir again. Beat the sugar, eggs and salt together with electric beaters on medium speed for six to ten minutes or until the mixture has tripled in volume and is thick and mousse like. Pour the chocolate mixture down one side of the bowl and fold in as gently as possible until just incorporated. Pour into a deep 23cm round silicone mould or lined cake tin. Bake at 160C for about an hour or until a skewer inserted into the cake comes out almost clean. Allow to cool, then turn the cake out onto a serving plate and dust with cocoa. Don't worry if the cake sinks and cracks, this is normal. 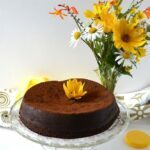 This coffee cardamom chocolate mousse cake is my entry for We Should Cocoa, the fab monthly chocolate challenge that’s just finishing it’s sixth year. It’s anything goes for August, so an easy month to enter. Thanks to Divine for sending me some of their fabulous chocolate to try. I was not required to write a positive review and my opinions, as always, are my own. I love the aroma of cardamom and I think it pairs really great with chocolate…this cake must be amazing! The ingredients don’t bear close scrutiny Angie, but it’s jolly delicious and a great cake for a gathering. Oh my gosh this sounds divine – no pun intended 😉 I’m not always the biggest fan of cake, but this kind of mousse cake looks like much my sort of thing! What an amazing sounding cake – I love all the flavours in it and the added interest from the cardamom. Please can you come and deliver me a slice. What a gorgeous looking cake! I love that is conveniently gluten-free and packed with real high quality chocolate. I gotta make this sounds, the flavor I’m sure is just amazing! Thanks Andrea, the flavours really are amazing. Good quality chocolate is definitely needed. These flavors just sound divine together! So beautiful and lovely! That looks glorious. Coffee always brings out the flavour of chocolate and I love the addition of cardamom. Thanks Jac. Very true. I never used to like coffee cakes, but it works brilliantly with chocolate. I’m confused by the direction. You said to beat the sugar, eggs, and salt with electric beater until mixture has tripled in volume…is that including the ingredients in the pot with the chocolate, butter, and cardamon or alone? If so, are we suppose to fold in the chocolate and butter mixture into the sugar/eggs mixture? Thanks so much for piointing this out and I’m sorry to have caused confusion. I’ve corrected it now. Triple the volume of the egg mixture, then fold in the chocolate mixture. just catching up with some blogging and somehow I started here with this stunner of a cake. This is so beautiful… and so lovely for you to be surrounded by so many wonderful places and food lovers!